I’m actually at a loss as to where to start this recap of the British Grand Prix. I was so exhausted after yesterday’s race (from ferociously tweeting and trying to keep up with events) that I felt like I needed a nap. I think the most obvious thing on every F1 fan’s mind is the tyre ‘exploding’ situation. Let me set the scene for you. With an ambient air temperature of 20°C and a track temperature of 31°C Silverstone was looking very pretty compared to the normal rainy races it has seen in the past. Hamilton had a great start with Vettel snatching 2nd place away from Rosberg in the first lap. Webber got seriously bogged down at the start before he got side-swiped by Romain Grosjean who seems incapable of avoiding a collision. Now here comes the ‘fun’ part. 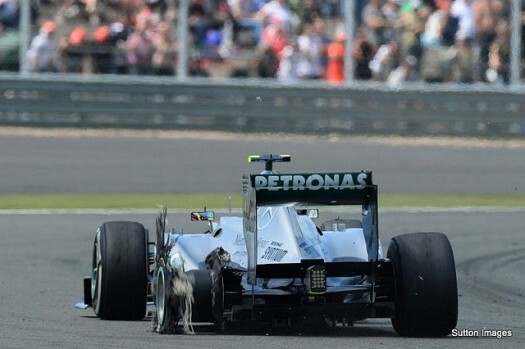 After a serene 7 laps, the eighth lap produced sparks when Hamilton’s left rear tyre simply explodes. It’s here where I’m feeling really bad for the Brit as it’s his home Grand Prix and it seems as if he has simply had some bad luck, not because the tyres haven’t been known to do this in the past, but because it happened to him while leading. But then a few laps later Massa’s left rear tyre simply pops. 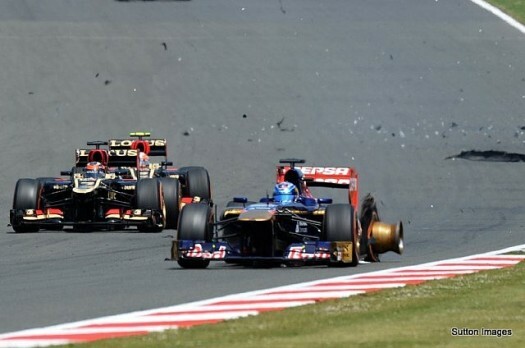 Then Vergne’s left rear tyre explodes followed by Perez’s left rear tyre. Are you seeing a pattern here? I know these tyres have been hotly debated and people are sick and tired of talking about the tyres, but this is becoming a safety issue and one that needs to be addressed by the FIA. Ultimately they are responsible for indicating to Pirelli what specifications the tyres need to be manufactured to, so in my opinion, they should be receiving all the flak. What I can’t understand is Pirelli agreeing to make such a marshmallow tyre as this is ultimately a marketing exercise for them and in my opinion 4 tyres exploding in a race is not a great marketing strategy. Yes people are going backward and forth about the tyres being under-inflated and that the curbs were ‘cutting’ the tyres, but F1 teams have been racing around Silverstone for decades, and only now with these Pirelli’s are tyres blowing out. So in other F1 news that seems almost forgotten after yesterday’s race is that Mark Webber has announced that he is leaving F1 at the end of this season to pursue a race career with Porsche’s new sportscar programme, which includes an entry into next year’s Le Mans 24 hour race. 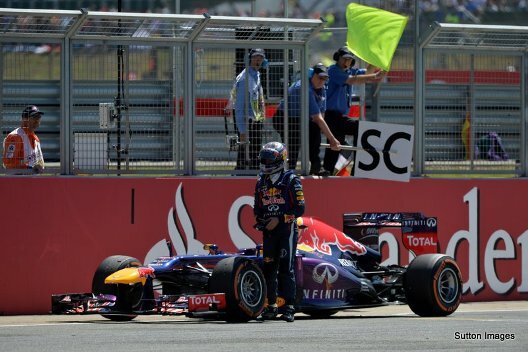 The Aussie veteran has had a good run in Formula One and it seems like his time has run out. He has constantly been out-performed by his teammate and has failed to become a Formula One champion despite his 11 years in racing. There is a reduction in wind tunnel usage and CFD (computational fluid dynamics) work, although exact figures on this are as yet unpublished. This reduction is intended to reduce cost and allow for teams to share wind tunnel use. In-season testing is to make a return in the form of four two-day tests. These will take place on the Tuesday and Wednesday after a grand prix weekend at four European races. With in-season testing brought in originally to reduce cost, this decision will likely balance out the reduction in wind tunnel and CFD usage. An additional set of dry tyres will be given to each driver to use within the first 30 minutes of the first practice session. This is to encourage additional track activity as the first 30 minutes are usually quiet. Fuel is limited to 100kg for the race and will be monitored by the FIA. Cars will look far more appealing next year with measures taken place to ensure the ugly ‘step-nose’ that has been adopted for the past two seasons will not be in place. A low-nose will be incorporated into the design specifications for all cars. I’m sure all of the above will still be fleshed out before the next season but it was interesting to note their thinking for 2014. And lastly I just have to go back to the events of yesterday’s race and get something off my chest. I am so tired of people saying ‘the race was so exciting though!’ when referring to the tyre incidents of yesterday’s race. Cirque du Soleil is also ‘exciting’ but it’s not racing. I feel robbed as an F1 fan to watch these rules and regulations change and ruin the sport. Tyres are been made to represent marshmallows so that there is better ‘action’ for the spectators by allowing for more pit stops. That’s all wonderful but more tyre degradation also means that in qualifying we have fewer laps as the teams are preserving rubber. We have fake overtaking mechanisms which allow the car behind to zoom past the front car if they are within a second in terms of racing distance. Bottom line is cars are now slower – F1 feels like a bit of a circus for me at the moment and it’s really depressing to look back at the ‘old days’ (making myself seem very old here) when it was plain and simple – just race. I don’t care if it’s more exciting for you to watch a different person win a race every second weekend. If you’re the best then the best will win every weekend. It’s as simple as that. Schumi got years and years of flak because he was the best and racing became ‘boring’. What rubbish. I never once found it boring as you were watching the master in action every weekend. He was the best, and the best deserve to win each time. Let Bianca know what you thought of the British Grand Prix, the tyre debacle and the failure of Vettel on twitter or in the comments below.